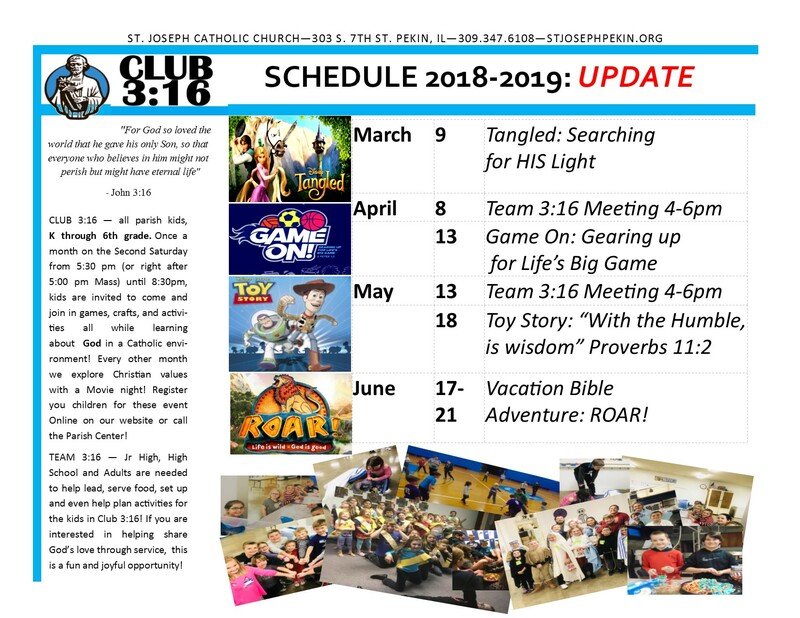 Club 3:16 is for all parish kids, K through 6th grade. Once a month on the Second Saturday from 5:30pm (or right after 5:00 pm Mass) until 8:30pm, kids are invited to come and join in games, crafts, and activities all while learning about God in a Catholic environment! Every other month we explore Christian values with a Movie night! Dinner will be provided, for more information call Anna McMahan at the Parish Center. Jr High, High School and Adults are needed to help lead, serve food, set up and even help plan activities for the kids in Club 3:16! If you are interested in helping share God’s love through service, this is a fun and joyful opportunity! Please contact Anna McMahan, D.R.E. at the Parish Center.